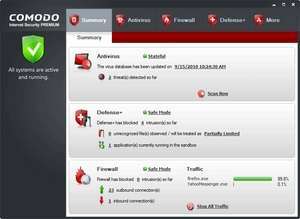 This is the free version of Comodo Antivirus. It offers full protection against common viruses common on the Internet, yet it doesn't deal with some of the more common problems of your PC included registry errors, one-click support, the award-winning Comodo Firewall and some other extras features only available in the Pro version. Though this product is completely free, it is worth nothing that the paid version offers a type of insurance plan with up to $500 of coverage in case your system *does* become infected with a virus and you lose data. Comodo Antivirus Free is able to be used for the life of the product, free of charge. Version 12.0.0.6810 is a freeware program which does not have restrictions and it's free so it doesn't cost anything. For security reasons, you should also check out the Comodo Antivirus Free download at LO4D.com which includes virus and malware tests. Additional screenshots of this application download may be available, too. Comodo Antivirus has a presence on social networks.